The wording is from Wakee` , and it has been reported from Abu Moosā , Abu Hurairah, `Ikrimah, and Abu Mālik. Ibn Khuzaimah in At-Tawheed, p. 107-118; Al-Hākim in Al-Mustadrak: At-Tafseer 2/282, and he said: This hadeeth is Saheeh upon the conditions of Bukhāree and Muslim, and it was not reported by them, and Adh-Dhahabee agreed. 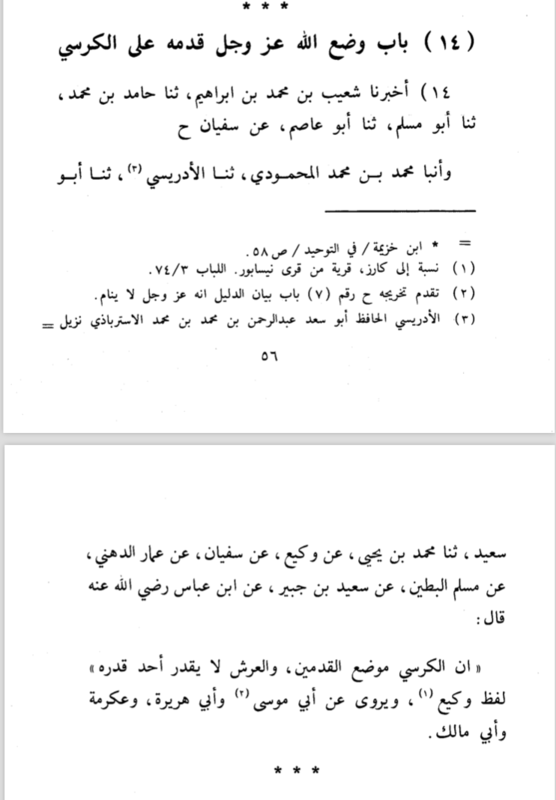 Shaikh Al-Albānee authenticated in his Mukhtasar al-`Uluww, p. 102. 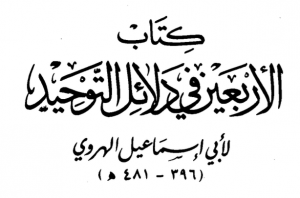 Ibn Jareer At-Tabaree in At-Tafseer, 3/10 and it in there is an addition. The affirmation of the attribute of the two Feet of Allāh in a manner that befits His Majesty, without likeness with the created beings. The belief in the Kursee (Footstool) and that it is the place of the Feet of the Lord. The belief in the mighty Throne (the `Arsh). That both the Footstool and the `Arsh are creations of Allāh. Ibn `Uthaimeen (rahimahullāh) stated: Though this is a statement of Ibn `Abbās, it is nevertheless ascribed to the Messenger (salallāhu `alaihi wassallam), because this is an affair where ijtihād has no place. The Prophet (salallāhu `alaihi wassallam) said: ((مَا السَّمَوَاتُ السَّبْعُ فِي الكُرْسِيِّ إِلاَّ كَحَلْقَةٍ مُلْقَاةٍ بِأَرْضِ فَلاَةٍ، وَفَضْلُ العَرْشِ عَلَى الكُرْسِيِّ كَفَضْلِ تِلْكَ الفَلاَةِ عَلَى تِلْكَ الحَلْقَةِ)) “The Seven Heavens as compared to the Footstool is naught except like a ring thrown out into an open desert; and the greatness of the Throne over the Footstool is like that desert over that ring.” Authenticated by Al-Albānee in As-Silsilatus-Saheehah 1/174.